Lia and Clay's love has broken the Little Mermaid's curse, but their ever after may not be as happy as they planned. Lia is adamant about staying on land with Clay for her senior year despite her family's opportunity to move to the new, sparkling capital city below the waves. Before any decision about the future can be made, her family must endure Melusine and her father's trial, where new revelations will have far-reaching consequences that threaten what Lia holds most dear. The verdict will shake Lia's whole world, calling into question her future with Clay, her feelings for Caspian, and the fate of all Merkind. As she wonders whom to trust, Lia sets out on a treacherous path that will lead her away from her sheltered Malibu home to a remote and mysterious school for Mermaids--Mermaids who may hold the secret to ancient magic Lia can use to either get back all she's lost or embark on a thrilling and dangerous journey where only she can define her fate. 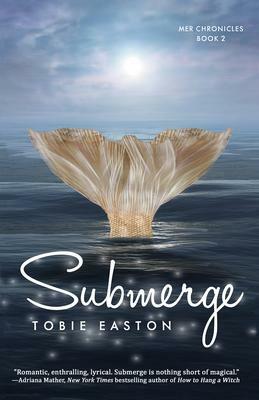 Submerge is the exciting and magical sequel to Emerge, Book 2 in the Mer Chronicles series by Tobie Easton.